So we are left with… left-overs! in the fridge and scratching our head – mind you in 10 years from now I won’t have any hair left because of this – what to do with it? …. Drumroll please…: add your vegetables to any soup recipe: the more fibers, the better for your digestion system. For vegetable soup … that means all kind of vegetables, without any one vegetable dominating, otherwise it the soup should be called according to the dominant vegetable. 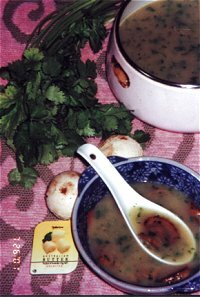 Having said so, the below recipe could also be called "cucumber soup with coriander". For taste: when you feel that the taste doesn’t come together and you have added enough salt already, add in some lemon or lime or a sour tomato. If available, saute any or all of these typical soup vegetables: onion, leek, celery and carrot. Let the green skin on the cucumber (that’s where all the taste is!) but remove its inner seeds. Cut cucumber into 3/4 inch (1,5cm) pieces. Heat the butter in a pan and brown the mushrooms for less than 1 minute. Add the lime juice, cover and let simmer for 10 minutes. In another pan : fry the onion in the oil until softened. Add to the onion the cucumber, pepper, stock-granules and boiling water. Cover and boil for 4 minutes. Afterwards take a mixer and mix until cucumber pieces are pureed. Add coriander and mushrooms, and put on the fire for 2 minutes more.